1) Van Gogh – First Maslow need satisfied with food and warmth provided by family. 2) Brueghel the Elder – Second Maslow need satisfied with safety provided by community. 3) Renoir – Third Maslow need satisfied with a sense of belonging and flow experiences achieved with friends. 4) Rembrandt – Forth Maslow need satisfied with a sense of self-esteem and further flow experiences expressed by family and friends. These four paintings, all with the dining table as the center of action, depict the satisfaction of the first four needs of Maslow. But what do the philosopher say? In my previous posts I mentioned the Epicurus was right up to a point. Epicurus agreed with the other ancient philosophers that the aim of life is happiness; however, he defined happiness as tranquility and freedom from pain and anxiety – the “good life.” In psychological terms, the Epicurean state of happiness is the satisfaction of Maslow’s first four needs of his hierarchy (achieved through a loving family, just society, and flow experiences). Remember, it is the flow experiences that distance oneself from the worries of the everyday world; however, you can’t approach these experiences without first having satisfied the basic needs of food and safety. The above paragraph is very remarkable: 1) we have a great philosopher, Epicurus, whose philosophy closely matches that of modern psychology regarding the necessity of a loving family, a just society, and flow experiences to lead one to a state free of pain and anxiety, 2) the same philosophy matching the first four of five levels of needs satisfaction of modern psychology driving human behavior, and 3) that a life free from pain and anxiety is one that avoids excessive greed, fame, and power, those things that will never lead to tranquility and happiness. In summary, we can go so far as to say that the end of the Journey, the “good life,” is the aim of Epicureanism. Or, to put it another way, the Journey segment of the road to happiness is philosophically one of Epicureanism. It is the best approach ethically for completing the Journey. Seek out flow experiences and you will have friendships, family love, financial comfort, and a sense of self-esteem. Not a bad life, in fact, a “good life.” But, not happiness. You also need the Adventure! This entry was posted in Uncategorized and tagged Aristotle, Bruegel the Elder, Epicurus, journey, Maslow, Rembrandt, Renoir, Van Gogh on May 1, 2015 by oliver. In my two previous posts I presented two paintings situated around the dining table. The first painting, by Van Gogh, expresses the satisfaction of the most basic of needs – food and warmth. In the painting this basic need is satisfied through the family. 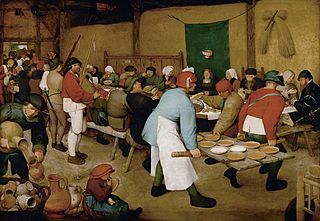 I then presented a painting by Brueghel the Elder in which the first need for food is satisfied as well as the second need for safety, which is provided by the community as well as the family. In this post I would like to present a third painting, a painting by Renoir. This third painting, also centered around the dining table, expresses not only the satisfaction of the first need for food as well as the second need for safety, but the third need for belongingness and a place among one’s friends. This painting is a magnificent depiction of sociability: friendship at its most sophisticated and glorious. This one painting, with its colors, food, wine, and conversation, perhaps best represents the satisfaction of the belongingness need for most people today. However, it differs from the Brueghel the Elder painting in that the characters are much less interested in eating (that need has been satisfied) and are less concerned with the safety of their surroundings (that need has also been satisfied). What is driving the action is the need to satisfy one’s sense of belonging and place within society. Unlike the previous two paintings, there is a sense of flow among the characters. The characters appear to be distant from the cares and anxieties of the everyday world. All of them are enjoying the moment as a reward in and of itself. There is no further motive than to enjoy the friendship of others. This painting differs from the Brueghel painting in that the characters are interacting with one another, lost in the moment, rather than side-by-side each other in the same room with each expressing their own place in life. Up next, the final painting along the Journey. This entry was posted in Uncategorized and tagged journey, Renoir on April 17, 2015 by oliver. In my previous post I discussed the “prose” or ideas of the three segments of the triangle – ancient philosophers, modern “positive” psychologists, and a mythologist. This triangle is a very good starting point for finding happiness, and the basic skeleton of my book. But it is only two dimensional. Happiness is so important that a third dimension is needed. 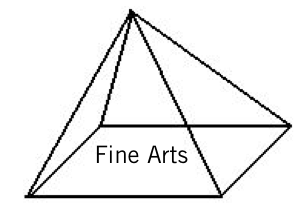 The masters of the fine arts supply such a third dimension. They turn the triangle into a pyramid. They provide depth to the human experience. They are self-actualized artists that convert human experiences into artworks that each of us can learn from. 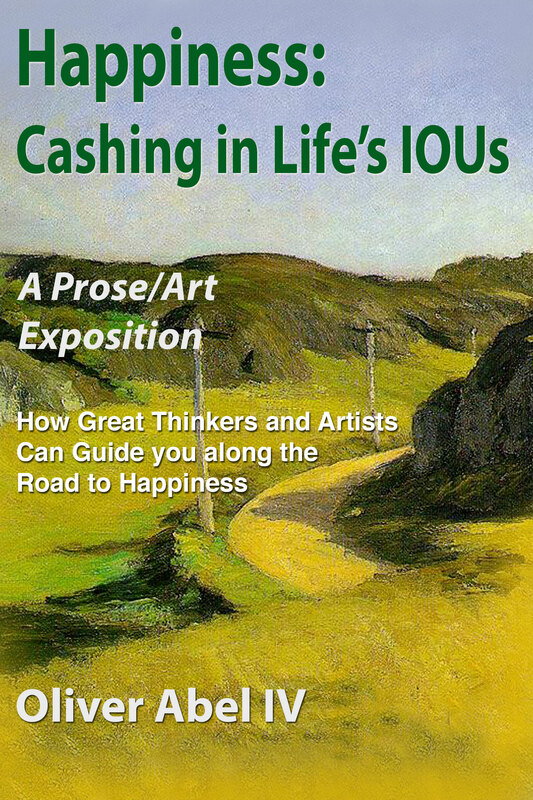 These same artists provide the much needed verification of the road to happiness that the thinkers on the triangle instruct us is the road to fulfillment. it is this verification that gives us the comfort to move forward in life. For example, this masterpiece by Renoir represents the pinnacle of the enjoyment of being with others. This work of art demonstrates what the thinkers believe is needed along the road to happiness – a sense of belongingness and a place among friends and in society. 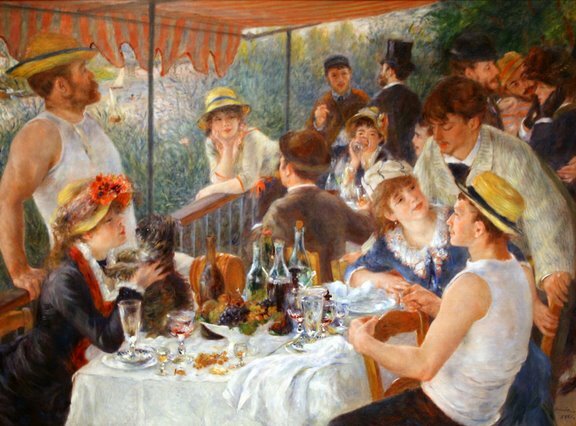 Renoir has captured this in a beautiful depiction of the enjoyment of simply being with others. With the achievement of such belongingness in society, each of these individuals is prepared for the next stages of life that move them closer to happiness. The pyramid of ideas or “prose” coupled with the “art” now gives us a very rich three dimensional representation of the road to happiness. But there is one dimension missing – the vehicle for traveling through the three dimensions. This vehicle will be discussed in the next post. This entry was posted in Uncategorized and tagged fine arts, fulfillment, happiness, Renoir on November 9, 2013 by oliver. In several of my previous posts, I presented artworks that best represent the feelings of those that have had their physiological and safety needs met (the first two of Maslow’s needs at the bottom of his Hierarchy of Needs). As such, they are able to move to the next level, one involving the need for belongingness. Below are two paintings, separated by time and class. Nonetheless, the need for belongingness is being satisfied by all involved. The feelings expressed in each work are nearly identical. Even though one set of characters are peasants in a barn and others characters are well-to-do members of society on a boat, the experiences are the same. These same experiences shared by all give us comfort that this need is universal and satisfied in a universal manner. This entry was posted in Uncategorized and tagged Belongingness, Bruegel the Elder, happiness, Maslows Hierarchy of Needs, Renoir on August 19, 2013 by oliver.